In his Survey of London 1589, John Stow wrote about the discovery of pots of Roman gold coins buried in Spitalfields and it had long been understood that ancient tombs once lined the road approaching London, just as they did along the Appian Way in Rome. 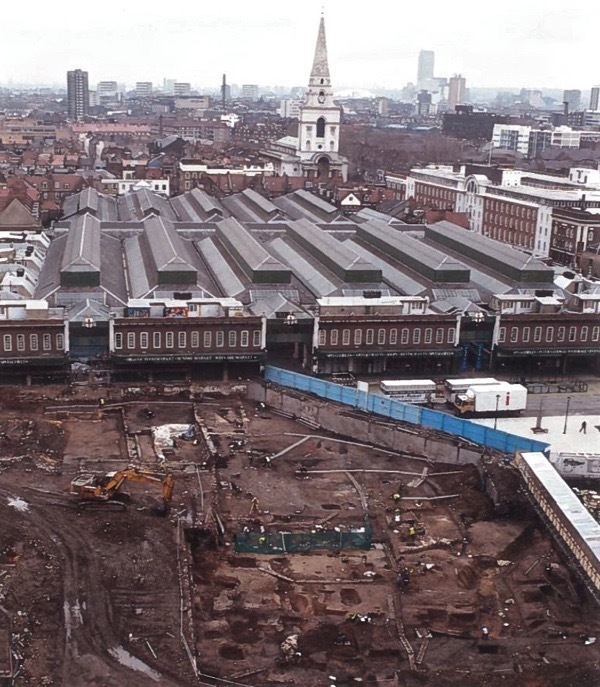 Yet it was only in the nineteen-nineties, when large scale excavations took place prior to the redevelopment of the Spitalfields Market, that the full extent of the Roman cemetery was uncovered. 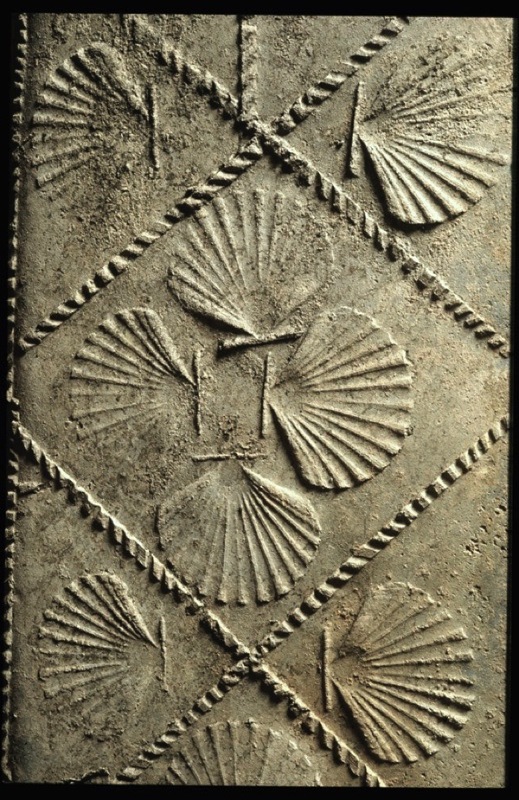 In March 1999, a Roman stone sarcophagus containing a rare lead coffin decorated with scallop shells came to light, indicating the burial of someone of great wealth and high status. Grave goods of fine glass and jet were buried between the coffin and the sarcophagus. It was the first unopened sarcophagus to be found in London for over a century and when the entire assemblage was removed to the Museum of London, the coffin was opened to reveal the body of a young woman in her early twenties, buried in ceremonial fashion. 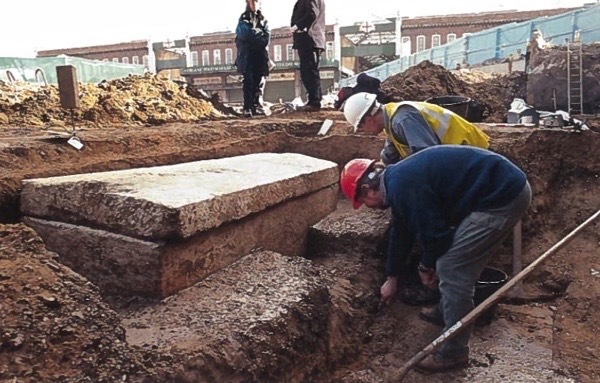 In the week after the opening of the coffin, ten thousand Londoners came to pay their respects to the Spitalfields Roman woman. She was the most astonishing discovery of the excavations yet, as the years have passed and more has been learnt about her, the enigma of her identity has become the subject of increasing fascination. Analysis of residue in the coffin revealed that her head lay upon a pillow of bay leaves, her body was embalmed with oils from the Arab world and the Mediterranean, and wrapped in silk which had been interwoven with fine gold thread. Traces of Tyrian purple were also found, perhaps from a blanket laid over the coffin. Such an elaborate presentation suggests she may have been displayed to her family and friends seventeen hundred years ago as part of funeral rites. The sarcophagus and grave goods are on public exhibition at the Museum but, thanks to Rebecca Redfern, Curator of Human Osteology, Contributing Photographer Sarah Ainslie and I had the privilege to visit the Rotunda where the human remains are stored and view the skeleton of the Spitalfields Roman woman. 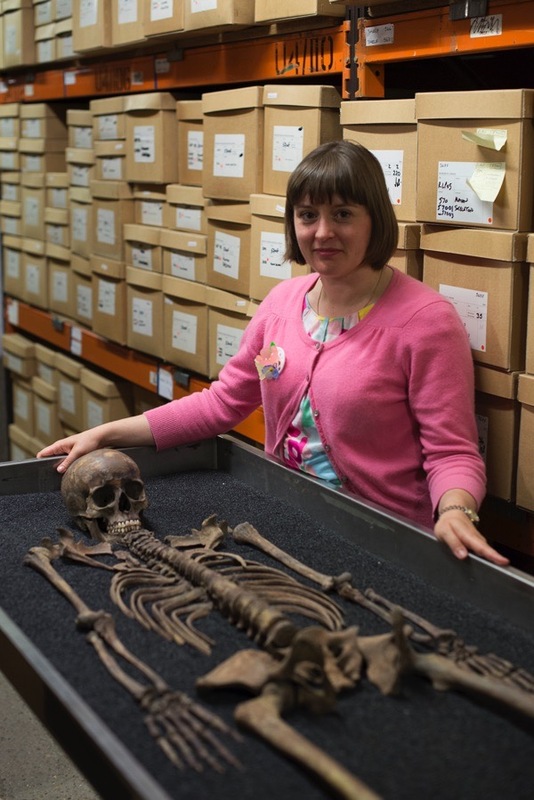 Deep in a windowless concrete bunker filled with metal shelving stacked with cardboard boxes, containing the remains of thousands of Londoners from the past, lay the bones of the woman. We stood in silent reverence with just the sound of distant traffic echoing. “She’s five foot three and delicately built, petite like a ballet dancer,” Rebecca continued, turning her attention swiftly from the living to the dead and gesturing protectively to the bones laid out upon the table. 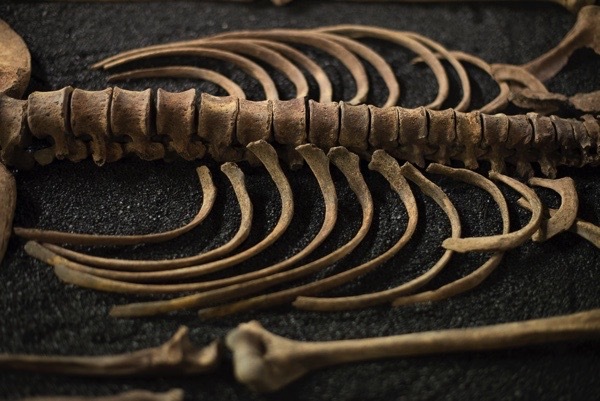 While some might objectify the skeleton as a specimen, Rebecca relates to the Spitalfields Roman woman and all the other twenty thousand remains in her care as human beings. “They’re able to tell us so much about themselves, it’s impossible not to regard them as people,” she assured me. 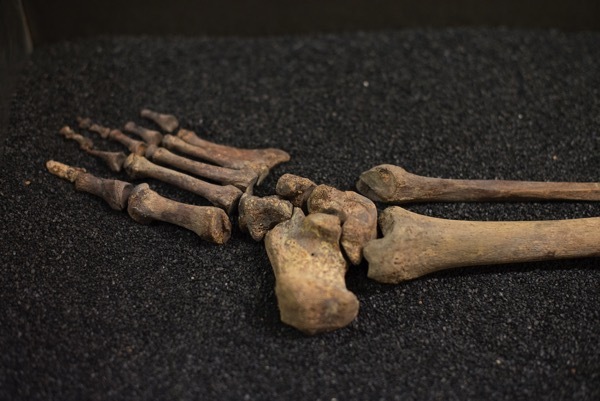 Recent research into the isotopes present in the teeth of the Spitalfields Roman woman have revealed an exact match with those found in Imperial Rome, which means that her origin can be traced not just to Italy but to Rome itself. “I find it very sad that she came so far and then died so young,” Rebecca confided, recognising the lack of any indication of the cause of death or whether the woman had given birth. Contemplating the presence of the skeleton with its delicate bones dyed brown by lead, it is apparent that the Spitalfields Roman woman holds her secrets and has many stories yet to tell. 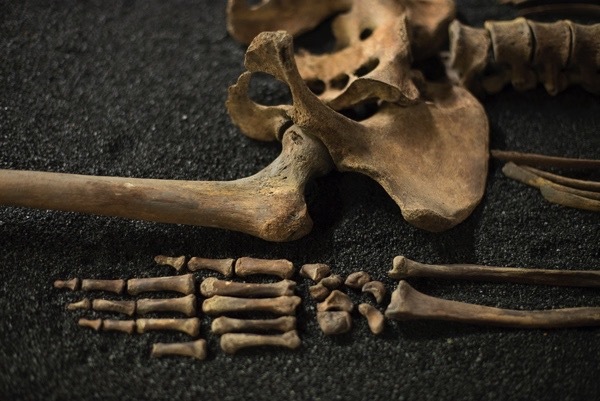 More than seventy-five Roman burials were uncovered at the same time as the sarcophagus, many interred within wooden coffins and some only in shrouds. You might say these represented the earliest wave of immigration to arrive in Spitalfields. Very interesting, indeed! Thanks a lot. Another fascinating article from the Gentle Author. Anyone any ideas how I can get on a dig as a new volunteer in the City, I’d love to do it. I live south of Manchester but come to London frequently and have friends there. Any advice would be much appreciated. Very interesting. I had the pleasure of visiting the Charnel House recently and the Roman lady was mentioned (although she was not found in there). The coffin lid is a beautiful design. 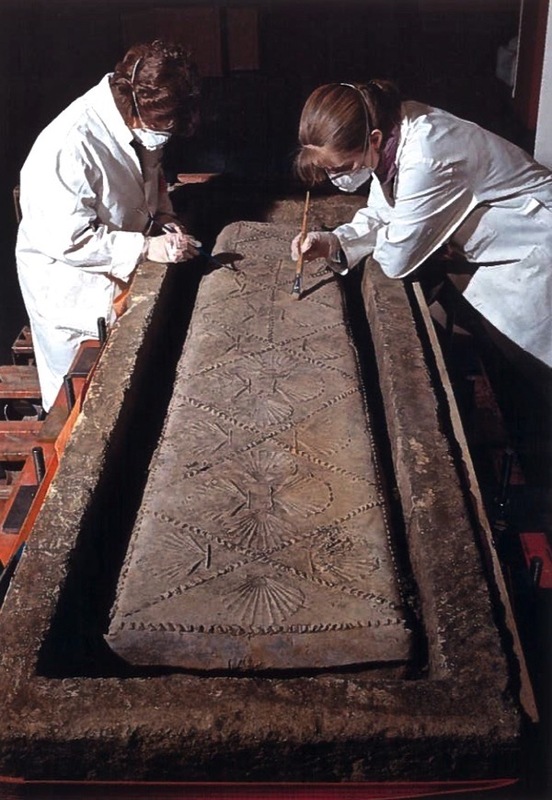 Very interesting, the decoration on the lead coffin is beautiful, the young lady buried in it must have been loved very much and it is good to know that her remains are still being treated with respect. Thank you for this GA. Fascinating. I also liked the curator’s attitude to her charges. may she rest in eternal peace . Christ is with her eternally. do we know what year it dates back to, did I miss that? Thanks, Gentle Author. The skull is so perfectly preserved that a forensic scientist could make a mold and reproduction, build the lady’s head and features on it with a high degree of accuracy, and let us see what she looked like in life. Wouldn’t that be interesting! hi, I love this. I saw a bit of this on the news and a woman who was studying the grave syte said there were glass vials buried w/ the body but she didn’t know what they were. but I think I do .loved ones used them to cry there tears into. morners then placed them in or around the sarcaufegis .sorry about the spelling. dyslexia. Good Early Morning, Here in the South, USA along newly built highways, one may still see old cemetery or graves of a family off to the side of the roads. When the highway through Port Gibson, MS USA was being leveled we drove along the side road, where, sad to remark were to graves with lovely marble markers of a husband and wife. Because this is the Bible Belt in the USA the people highly believe in burial not cremation, for the dead to be brought to life again at the “resurrection” at the end of the World??? People here still believe in this and bury their relatives with memorials of their life. We are an aging people citizens of the USA and now look back at a rite or ceremony that is part of a religious belief of respect for the dead. One day when the USA if it is still a united land, will people look back at the graves as a historic even, opening up caskets, viewing what is left of the body, the hair, teeth, bones, what items were buried with the body-what historic value becomes to some moneyed value. In the area of Port Gibson, MS USA there are mounds with immense historic value, but are untouchable as if that is the correct term. The Native Americans have reverence for the dead. There in the mound is the body and ceremonial garb of a great warrior-a Chief. Your readers will wonder why an old American writes this worthless set of words, well, we are some of us Scottish, English, Irish or Roman (if I may) heritage. And sort of think about our comparisons of historic values in finding old burial grounds, even those of our grandparents born in the 1885-1892 in the USA. I have just discovered your website and am looking forward to reading more about London. I have few opportunities to travel to London, as I live in Canada, but she remains one of my central interests in life. I read as much as I can about her, and am so pleased to have found a site which delves into her more hidden and personal aspects. Thank you so much Gentle Author. 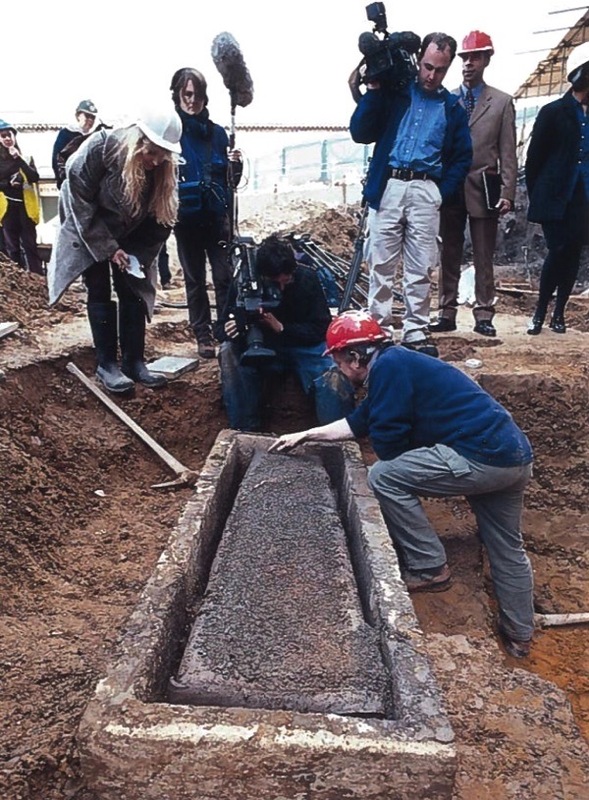 I remember being really proud as I was the only female archaeologist asked to help carry the lead sarcophagus of site, I was one of six and was at the back with a guy of similar height, it was very heavy. Then a week later we were invited to the museum of London to see her on display, she was amazing. Very interesting article. A blast from the past.